If you can not come to our centers, or need a special glasses with Palomar filters to improve vision, contrast or eliminate the photophobia, we offer you the possibility of ordering a special glasses with Palomar filters by filling out the following questionnaire. Once all the data are valued, we will contact you. 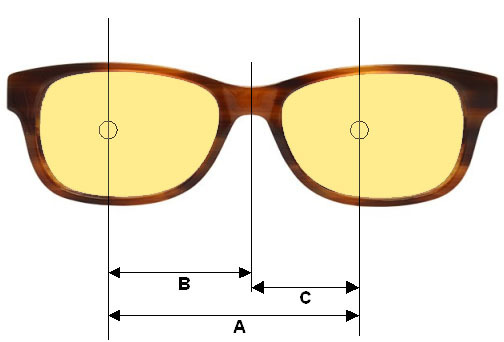 BINOCULAR INTERPUPILAR DISTANCE (A) mm. RE NASOPUPILAR DISTANCE (B) mm. LE NASOPUPILAR DISTANCE (C) mm. BY CARRYING OUT THE ORDER YOU ARE RESPONSABLE THAT THE PROVIDED DATA WILL BE REAL, ANY ERROR IN THEM AND CONSEQUENCES, WILL BE YOUR RESPONSIBILITY, NOT ADMITTING ANY CLAIM FOR THEM. WE BEG YOU TO CHECK WITH THE MAXIMUM ATTENTION ALL THE INTRODUCED DATA TO AVOID ERRORS. AS SOON AS POSSIBLE WE WILL KEEP IN TOUCH WITH YOU.